According to the UN Population fund, in 2014, 54% of the world’s population lived in Urban areas, approximately 3.3bn people. By 2030, roughly 66%, or 5bn people will live in Urban areas. This not only represents a massive challenge in how we build and manage cities, but a significant opportunity to improve the lives of billions of people. Rising to that challenge, engineers worldwide are turning to new technologies such as the Cyber Physical Systems (IoT/M2M), 5G, Big data analytics etc., searching for new approaches and solutions that will improve city transportation, water and waste management, energy usage and a host of other infrastructure issues that underpin the operation of cities and the lifestyle of urban citizens. 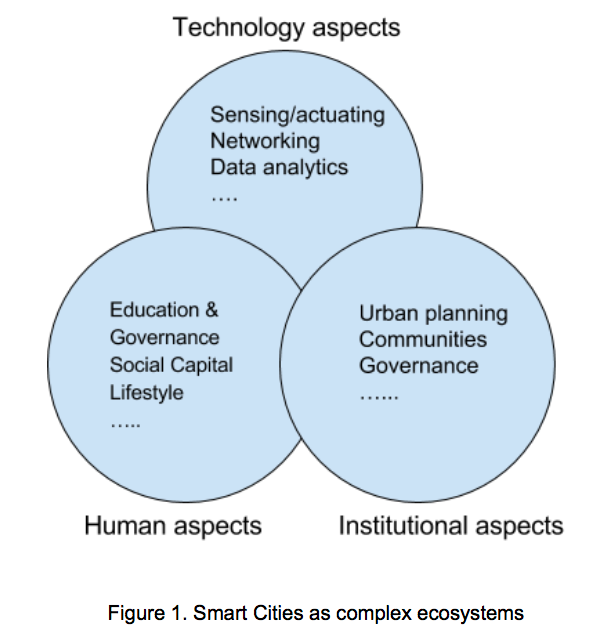 This definition emphasis that a Smart City is not just a city that leverage new technologies; it is a complex ecosystem made up of many stakeholders including citizens, city authorities, local companies and industry, community groups. Further, it should be stressed that the geographical boundaries of what is called a Smart City may be wider than the city itself, gathering multiple governance bodies and municipalities, to define services at the metropolitan or regional scale. In this trend report, we focus on technology trends that are shaping how Smart Cities are evolving, however, it is important to ensure that when considering the application of technologies to solve problems, the human and institutional aspects are taken into consideration. In essence a cardinal goal of the Smart City is to create value for its entire ecosystem, whether this value is financial, quality of life, health, education, time, etc. The value created by a Smart City can be assessed using both quantitative and qualitative metrics. 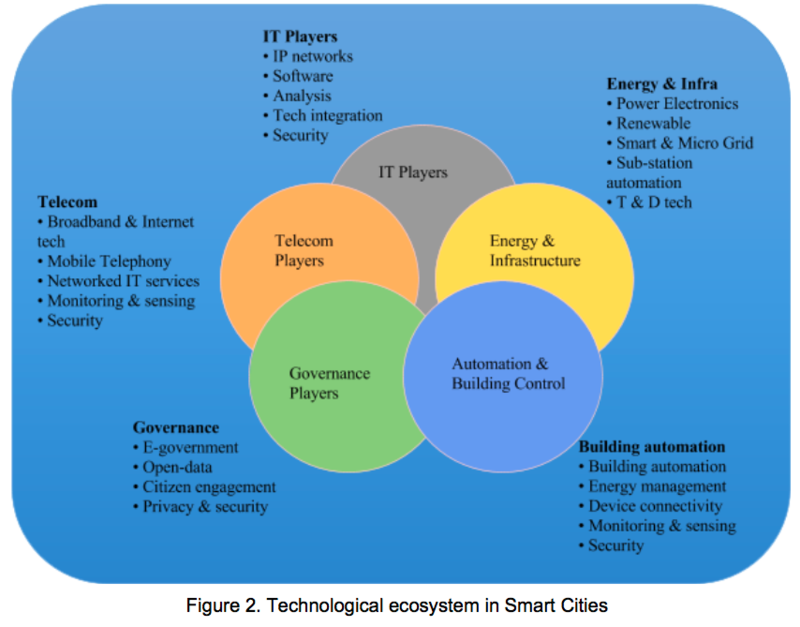 From the technological perspective, the Smart City ecosystem is a complex one, comprising many technology areas. Major players operate in several areas providing solutions that complement (and sometimes overlap) other players. Those companies that are able to do so, are working towards a convergence point where they can provide end-to-end solutions to city technology needs. However, most players lack the scale to achieve this and must work in collaboration with partners from other technology segments. To visualize the technology ecosystem, we can identify five key technology groupings (based loosely on a Frost and Sullivan report) as shown below. effective Smart City services by themselves, this is not the norm. Rather, it is often the case that successful Smart City deployment requires a number of companies to work together to combine solutions and technologies ranging from the low level sensors/actuators, effective data communications, data gathering and analysis to domain specific applications such as healthcare, energy, transport etc. Underpinning the growing Smart City market are a number of broad ICT technology trends that enable the key segments such as energy, transportation, urban planning etc., to exploit new technologies to deliver smart solutions to cities and citizens. In the following section we highlight a number of these key technology trends and their impact on Smart Cities. Low Power WAN technologies. Fitting a niche in the technological landscape between personal/local area networking technologies, such as BLE, Zigbee, WiFi etc., and licenced cellular networking, such as existing 3/4G, and the evolution to 5G sit technologies such as LoRaWAN and the evolving 802.11ah. These technologies use unlicensed spectrum and focus on low power and low cost. While some argue they are a stop-gap measure before the deployment of 5G networks, they are the subject of much interest, and a number of trials have been carried out by NTT in Japan, SigFox in France and Australia and Comcast in the USA. One major appeal driving city adoption is the ability to offer a city-wide service, for free, at a relatively low capital cost, an approach taken by the non-profit organization ThingsNetwork. 3/4G evolution. While there is significant activities around the development of 5G standards, these are not expected to have full deployment until 2020. In the meantime a number of important initiatives are focused on mid-term evolution of existing cellular technologies. The 3GPP consortium is working on several activities including work on CAT-1 (and Cat-0) as well as the upcoming CAT-M1 and the Narrow-Band Long-Term Evolution (NB-LTE). These standards focus on IoT scenarios and include better energy efficiencies, cost reductions and better penetration/density – all critical for IoT situations in Smart Cities. 5G: Next generation networking (5G) is the subject of intense technological (and business) activity with a number of major initiatives underway. 5G aims to address some of the key future needs of smart cities with higher bandwidth, delivery and performance guarantees, adaptability, energy efficiency and real time capabilities. 5G is still an evolving space, with considerable discussion on its long term goals and technologies. This complexity and rapid rate of change in the 5G space makes it difficult to provide more than a brief overview. For a fuller exploration of 5G please see the IEEE Industry Trend paper on 5G published as part of this series. Irrespective of the evolution of 4G and the eventual transition of 5G, two critical technology trends that address the need combine multiple evolving technologies are Software-defined Networking (SDN) and Network Function Virtualization (NFV). Obviously this complex networking landscape poses a challenge as operators and users grapple with needs that span multiple technologies. One solution to this is the adoption of SDN and NFV technologies that allow network operators to mix and match services using SDN, and to push more intelligence into their networks (edge processing) using NFV,. Cyber Physical Systems and the Internet of things (IoT), defined generally as the connection and virtual representation of physical devices to the internet, is critical to the growth of Smart Cities. While it is the case that many parts of traditional city infrastructure have been monitored for many years (traffic, water, electricity), these were often monitored using proprietary technologies and maintained as individual silos. The IoT is changing that situation radically. City infrastructure – some of which may have been traditionally monitored – is now being connected using open standard protocols (IP, HTTP, etc.) and made accessible through web technologies such as REST. Lower ‘hookup’ costs are allowing the sensing to expand to more parts of the city infrastructure and enabling higher fidelity sensing. A good example is energy management, although traditionally many cities (via public or local utilities) have been able to measure and monitor some city energy usage, increasingly private and commercial buildings are being hooked up via smart meters which in turn enables the adoption of micro-grid technologies. Importantly, this trend to better sensing (and actuation) is not just about sensing city infrastructure such as roads and sewers. The costs and accessibility of IoT technologies is allowing private companies to instrument public infrastructure themselves. For example, auto manufacturers are increasingly sensing, not only the car itself, but its surroundings, traffic conditions and even providing sensed data in the case of accidents. Civil engineering firms are deploying sensors to monitor stress in structures such as tunnels, bridges or the quality of road surfaces. Equally, citizens are deploying low cost sensors to track air pollution, noise levels or just employing their smartphones as mobile sensor platforms. Obviously this growth in sensing is underpinned by wired and wireless communications, with low power mesh networking and the eventual move to 5G as key technology trends. While the IoT is driving a revolution in the ways we are able to sense and control the world around us, in the Smart City environment there are several technology trends – and issues – that are driving the way we can harness the IoT. The sheer volume of data that is being generated is driving its own needs both in the platforms needed to capture and store the data, and in the tools and techniques needed to analyze the real time data. We will explore cloud technologies in support of Smart City platforms as well as trends in Big Data technologies in the sections below. Cloud computing has had a significant influence on the development of Smart Cities, affecting both the way cities manage and deliver services, and enabling a broader set of players to enter the Smart City market. Cloud computing – defined generally as the delivery of computing as a service – has offered organizations such as cities ways to reduce costs and increase efficiency. Due to legal and privacy concerns, cities have been reluctant to exploit the full benefits of public cloud services for core services, but many have used private cloud and some have experimented with public/private or hybrid cloud infrastructure. Where public cloud has been exploited, it has often been for non-core services or newer services. For example, Barcelona (Spain) has used public cloud infrastructure to deliver identity services and device management for its field-based workforce, for data analytics and to improve its CRM systems for managing citizen interactions. A secondary factor driving the adoption of cloud solutions for Smart Cities is the massive increase in data that is being generated, captured and analyzed by cities as they start to deploy and exploit IoT technologies. New infrastructure sensing, combined with private data sources and citizen data means that cities now have access to a multitude of high-volume real-time data sources. While there are a number of examples of this use of cloud infrastructure in cities, Intelligent Transportation is a lead use-case, for example Taiwan has exploited cloud computing to handle the high data volume from its intelligent transportation systems (ITS). While cloud computing is an established part of Smart City solutions, an emerging trend is the augmentation of cloud computing with Edge (also known as Fog computing). Edge computing is a term used to describe the deployment and use of processing within and at the edge of the network. This trend leverages the rollout of IoT infrastructure which often includes powerful processing and gateway devices to gather and communicate sensed data. The Edge computing model offers cities ways to manage and monitor distributed infrastructure – for example Intelligent Transportation Systems (ITS) – where processing is often best handled close to infrastructure for performance and timeliness reasons or building management systems focused on energy efficiency.